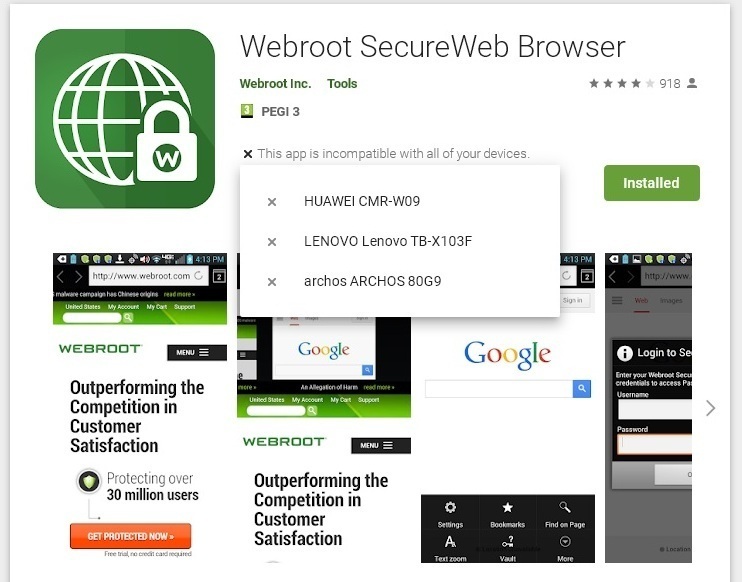 Why device is "Not currently compatible with Webroot Secure Browsing."? I'm sure this has been answered before but I can't seem to make sense of the other answers so I'm just going to post because for the life of me the steps on the older post make zero sense to me so someone please help! I have a Galaxy S8 and installed the mobile security app for Webroot but I'm getting this, shown in the picture, when I have a code that has been entered and activated. So my question is why is my phone not compatible? There was some difficulty providing secure browsing on your device through our Mobile Security app. We are researching solutions, so hopefully this is just temporary. My phone has the same issue. This is a recent change/problem. I also have the Webroot Secure Browsing app loaded that works, but not sure why this feature is not working on the Mobile Security app. I have the most recent version of the Webroot mobile app loaded 5.0.0.10759. I have a Verizon/Motorola Z Play Droid Android Version 7.1.1. I'm interested in any information on the fix you can provide when available. Thank you. Any updates for a solution for this? If not, where is it on the list of fixes? I see that this issue goes back to 2/18. Currently having this issue with 2 out of 3 moble devices. Motorola phone and new Samsung tablet. Talked to support and they say this issue is being investigated. They asked the model numbers of the devices and said they would add them to the list of devices with this issue if they weren't already on it. Also said not to worry, you are still secure. - Even though there is a warning that "You are at risk". Hmmm. Subscription will expire in 3 weeks....probably going to look into a different security software. Well, I was thinking of adding some extra seats to cover my android devices, but it appears that there isn't a mobile application that full works. For several years, I used the free version on my Samsung tablet and and had no issues. But then about 2 months ago, Webroot said that I had a couple of issues. I currently have SecureAnywhere Mobile installed. It says that Secure Web Browsing is turned off and that I need a separate application. When I say to fix this, it takes me to a page that sayd that the needed application is not compatible for this device and there is no button to install it. I've searched the store for other Webroot apps thinking that I need a new app, but I'm not really finding any that seem appropriate. There are a couple that are grayed out and had an old tag. There is the one I already have (which it says may not be optimized for my device.) And one for VPNs. So are Android devices no longer supported? Just to make sure do you have this version of Webroot Mobile here? And yes to your second link. I have that one installed, but it said when I updated that it might not be optimized for my device. but it let me install it anyway. So those were both the links that my device was taking me to. Sorry that I wasn't able to help out much. At this point would you mind Submitting a Support Ticket and they can see what is going on? I have a Samsung Note 8 and I am not having this issue. But you are using a Samsung Tablet and I have heard of this incompatibility before. Just bot new Samsung tab S4 and installed Webroot, but secure web will not install either from the program or from Play Store. Play Store says not compatible with my Samsung S4 Android tablet. Why can't I install Secure Web on this, the latest tablet? By the way, I am not a new member as indicated on my post just filed, I am a long-time subscriber and rather perturbed that play store is not allowing me to install this auxiliary program. please advise. I contacted support about this and they said that they were aware that the software was incompatible with a small number of devices. They said they were looking into a fix but didn't know when it would be available. They did say that the main application does work, so I think they were saying that I'm still protected even though the second application can 't be installed. I hope I have paraphrased them correctly. Thank you Kev..appreciate your checking on this for me. My Google Pixel C, running Android 8.1, the latest update, has the same incompatability issue. Be sure to Submit a Support Ticket so they can look into it for you!